In the wake of its showing at CEDIA EXPO 2013, Remote Technologies Incorporated hosted the RTI Global Partner Summit 2013 in its hometown of Shakopee, MN. The second annual event was held from September 29 to October 2, and included attendees from 15 countries and six continents. "We had an amazing time with our international partners during last year's inaugural RTI Global Partner Summit and have been looking forward to this year's event ever since. It certainly didn't disappoint," said Pete Baker, vice president of sales and marketing for RTI. "The event is a nice blend of education and fun, with informative seminars and the opportunity to enjoy time with our colleagues outside of the office as well. It also gives our partners the ability to meet RTI staff in person, see the inner workings of our headquarters, and gives them direct access to all levels of our organization. It is an extremely valuable experience for all parties and a great way to cap off CEDIA." 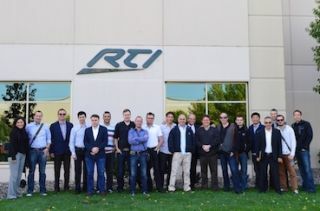 The Global Partner Summit 2013 included some of the company's most valued international partners, who attended seminars covering a broad range of subjects — including RTI products, programming, sales strategies, and more — from a variety of presenters. The seminars were combined with fun-filled, mid-western-style evenings to welcome RTI's guests to the Twin Cities. "For me the RTI Global Summit is an event not to miss. It provides an extremely valuable opportunity to share ideas and goals amongst partners and friends of RTI," said Joe Barhoush, president of GES Ltd. "In addition, we gain an outlook of what lies ahead for RTI and the company's innovative solutions. I know we all appreciate the hospitality and experience provided by RTI. I can't wait for next year's summit!"